Pat Conant is a New England artist, printmaker, painter and muralist. Her works have been extensively shown in many galleries, as well as local and national exhibitions. Some of these include the Boston Printmakers Exhibitions, the Academic Artists Association Exhibitions, Allied Artist of America, New York; the Society of American Graphic Artists, New York; the Miami International Print Exhibition, Florida; The Philadelphia Print Club, Pennsylvania; the Albany Print Club, New York, the Cove Gallery in Wellfleet, and Cape Cod Art Association. She has won awards in both her prints and paintings throughout her career some of which include, the Decordova Museum Purchase Award, the Berkshire Art Association Graphics Award, the Cain, Hibbard and Myers Award, WGBY Critics Award Prize and the New Bedford Arts Festival 1st Prize. Her work is in the collection of the Decordova Museum, the New York Public Library, the Library of Congress, the University of Pittsburgh, the Massachusetts Mutual Life Insurance Co., and the State Street Bank. 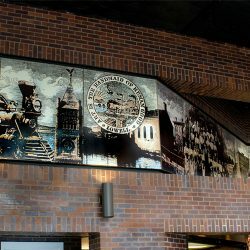 As a muralist she has completed murals for the Charles A. Gallagher Transportation Terminal in Lowell, Masschusetts, the Baystate Medical Complex in Springfield, Massachusetts and the Westfield, Massachusetts Courthouse. Visit our Featured page for more of Pat’s work. 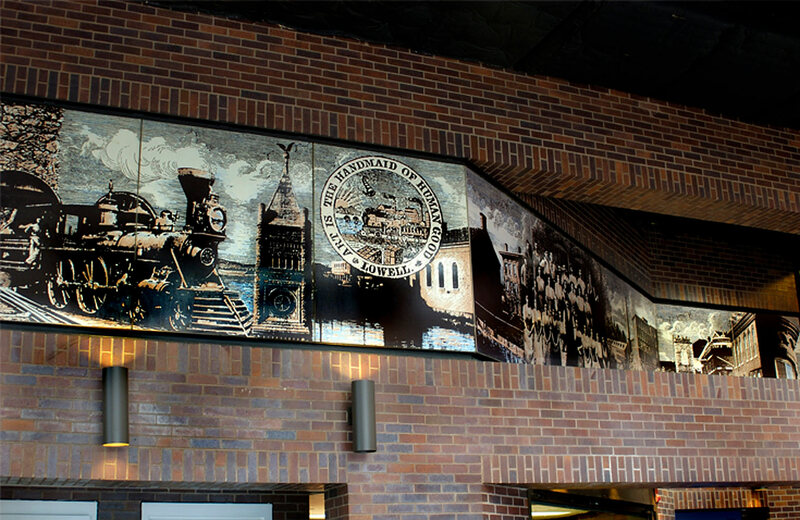 Pat Conant – The Charles A Gallagher Mural is a 5′ x 55′ mural porcelain enamel on steel and at the Charles A. Gallagher Terminal in Lowell, MA. Select image to view larger. 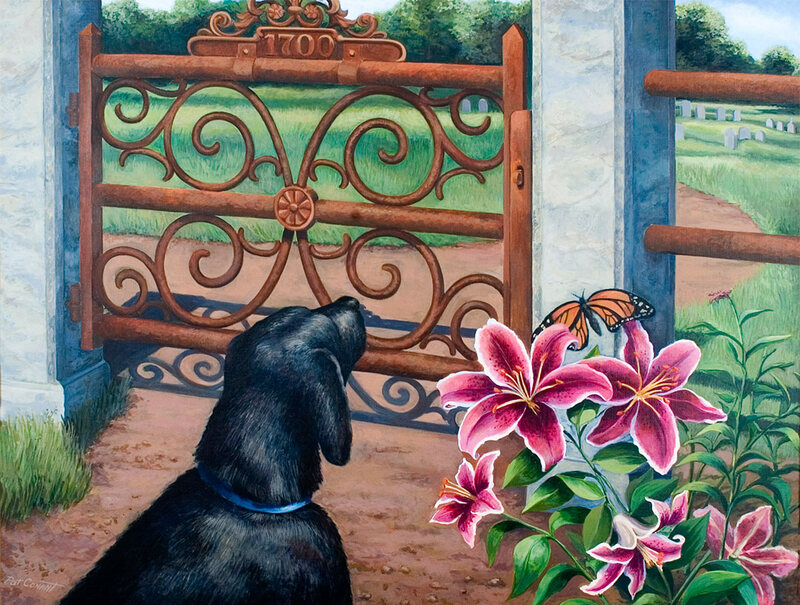 Pat Conant – “At The Gate” © large size acrylic painting. Select image to view larger. 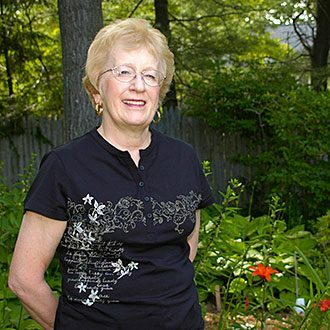 Artist, teacher, author, Mary Ann de Buy Wenniger is a well-respected art dealer and gallerist of forty years in Boston, Rockport, Provincetown and now co-owns Wenniger Cottage Gallery and Print Studio in Gloucester, Massachusetts. Mary Ann studied Art history at Boston University and New York University. She received an M.A. in art education from Harvard and a M.F.A. from Vermont College. 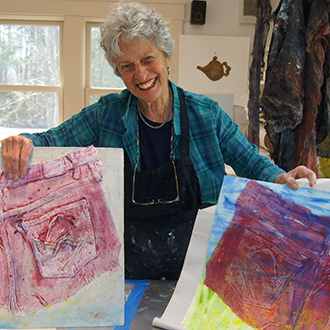 Mary Ann learned printmaking at the Radcliffe Institute and DeCordova Museum, and is a self-proclaimed course junkie delighting in learning new things. Mary Ann was one of the first artists to experiment with the collagraph during its genesis in the 1960’s when polymer glues were developed that make it possible to create permanently adhered collaged plates and print them on rag paper using an intaglio press. She purposely uses new colors for each print; thus each print is unique. The plates themselves are art works. They take weeks to assemble. She uniquely combines elements of sculpture and printmaking. Wenniger collagraphs captivate with their genre scenes, poetic titles reflecting her optimistic spirit. Their hand wrought, painterly surfaces shine with rich colors from heavy printmaking oil inks used. Although printmaking implies multiples, for Wenniger each print becomes a painting. Wenniger collagraphs are primarily in private homes with some in corporate collections: First Bank of New Hampshire, Bank of Boston, Fidelity Investments, Rockefeller collection. 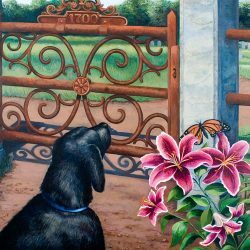 Visit our Featured page for more of Mary Ann’s work. Tara Conant is a professional photographer as well as a photo educator. She earned a Master of Fine Arts in Photography from Bard College. She has taught photography at Westfield State University, Holyoke Community College as well as other colleges during in her career. Her photographic work has been shown in solo and group exhibitions throughout the United States for a number of years. Some themes and subject matter she explores in her photographic work range from street photography, documentation of the representation and treatment of women in society to environmental issues. 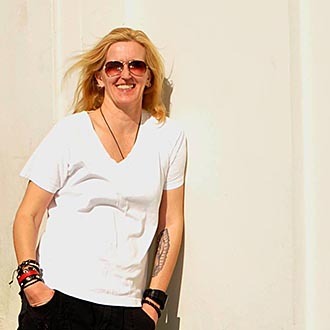 She has earned recognition for her work including a Massachusetts Cultural Council Artist Grant for her documentary series of photographs entitled Sites and she was selected as one of the 2000 Women in Photography by Women in Photography International. Additionally, she works as a freelance photographer. Visit our Featured page for more of Tara’s work. 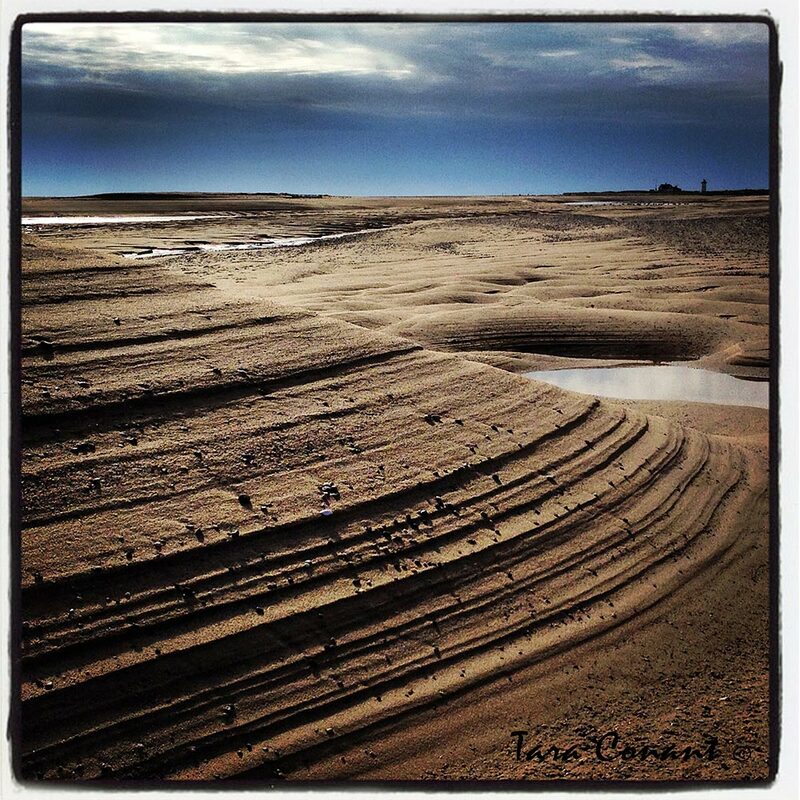 Tara Conant – “Ripples” © photograph. Select image to view larger. Tara Conant – “Yellow Boat” © photograph. Select image to view larger. Wendy Cressey received her BA in Graphic Design from Westfield State University. 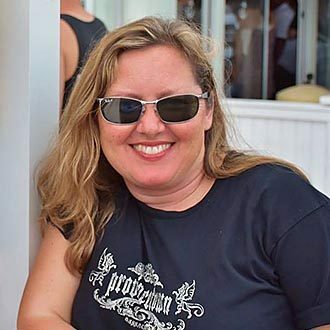 She has continued her education by taking endless graduate classes in photography and printmaking at RISD, Massachusetts College of Art, Montserrat College of Art, and at Island Center Skopelos, Greece. 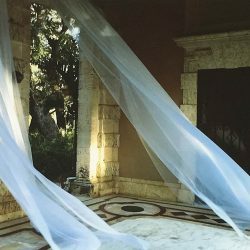 She has received numerous awards for her work and has traveled extensively throughout Europe and the USA gathering subject matter for her art which includes landscapes, architecture and her favorite musicians. She has printed and collaborated with famous printmakers in their studios. Most of her work is in private collections. Aside from her art-making she is also a business entrepreneur and establishing a gallery has been a life long dream since she managed Wenniger Graphics on Newbury Street in Boston. Visit our Featured page for more of Wendy’s work. Wendy Cressey – “Greece” © photograph. Select image to view larger. 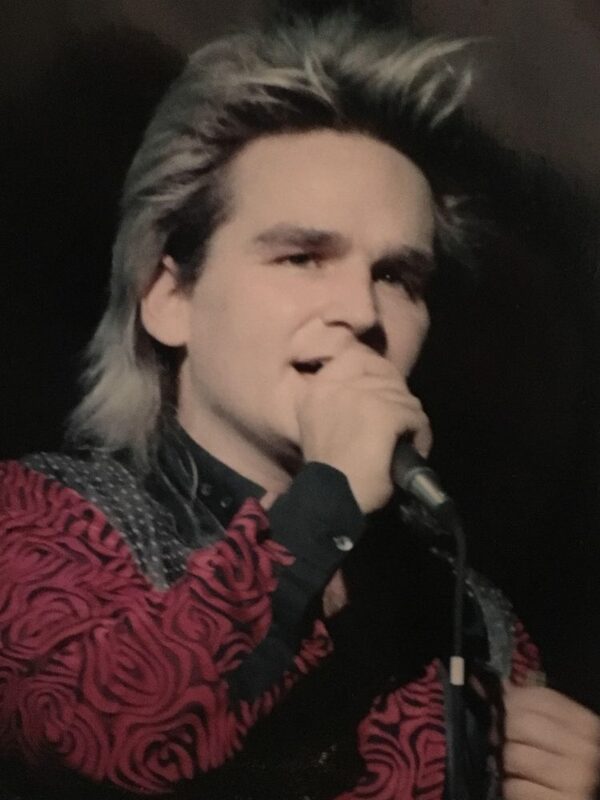 Wendy Cressey – “The Alarm, Mike Peters” © photograph. Select image to view larger. Gallery 444 PTown was pleased to welcome the following artists friends to our Group Showing that was held on May 31 to June 7 and Grand Opening Party held on Friday, June 2nd. Robert Aller was born in Springfield, Massachusetts in 1947. He began making photographs at the age of nine working in an improvised darkroom in a friends Victorian Era house. 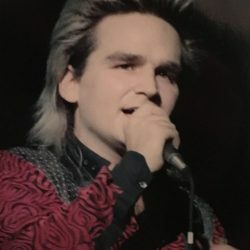 He received his BA in Journalism from the University of Mass-Amherst, and earned his MFA from the Milton Avery Graduate School of the Arts at Bard College, Annandale-on-Hudson, New York. His work has been published in Changing Prospects: The View From Mount Holyoke, a monograph of historical and contemporary paintings, drawings and photographs published by Cornell University Press for the group exhibition at Mount Holyoke College Art Museum in 2002. Other publications where his work has been published include the monograph Phone.tography, Vermont Center For Photography, Brattleboro; also Unclothed: The Human Form, Vermont Center For Photography; and most recently in Newfoundland: An Unusual Twilight, a self published monograph of color photographs and Envisages, a monograph of mobile iPhone photographs, also self published both in 2014. He has printed the photographic work of the painter/photographer Arnold Skolnick for his book Love Song and for his exhibitions of that work. Aller also printed the work for photographer Carrie Mae Weems for the monograph Carrie Mae Weems. His work is in various collections including the Museum of Modern Art, New York; Smith College Museum of Art, Northampton, MA; the Danforth Museum of Art, Framingham, MA; The William Benton Museum of Art, UCONN-Storrs; the University Museum of Contemporary Art, University of Massachusetts-Amherst; Mount Holyoke College Art Museum, South Hadley, MA, Holyoke Community College, Holyoke, MA; Maine Museum of Photographic Arts, Portland, Maine; Elizabeth Moss Gallery, Falmouth, Maine and private collections. 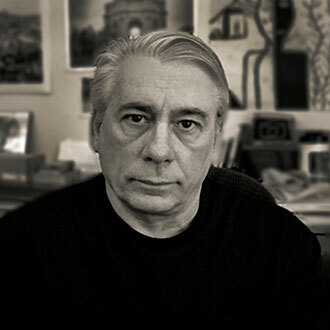 He is a Professor Emeritus of Photography and the former Photography Program Coordinator at Holyoke Community College, Massachusetts where he continues to teach and lecture part-time. Working with various photographic approaches, he has most recently been working in various alternative processes including Ziatype-palladium prints and other related processes. He lives in Chesterfield, Massachusetts. Visit our Featured page for more of Robert’s work. Robert Aller – “Fork” © photograph. Select image to view larger. Christopher Lizon was born in Springfield, Massachusetts in 1974 and currently resides there. He has received a B.F.A. from the University of Hartford/Hartford Art School in 1999 and an A.S. Visual Arts from Holyoke Community College – Holyoke, Massachusetts in 1996. 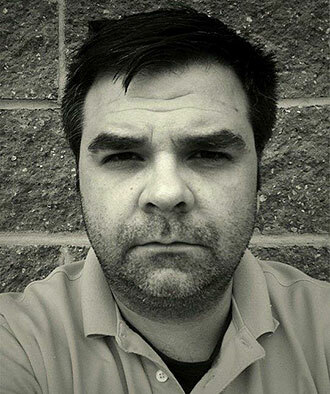 Currently Christopher is an Adjunct Faculty of Photography and Photography Lab Technician at Holyoke Community College in Holyoke, Massachusetts. 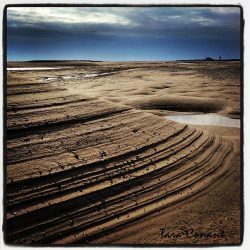 His photographs have been included in many local group and solo exhibitions and some prints are in private collections. He has also performed traditional black and white darkroom printing for photographer Jerome Liebling and painter and photographer Arnold Skolnick. Christopher utilizes both traditional photographic film and darkroom printing methods as well as digital capture and inkjet printing. Some of his photographic inspiration has come from the works of photographers like Sally Mann, Rania Matar, Nancy Rexroth, Gwen Coyne, and Jose Luis Ollo. One of Chris’ early bodies of work focuses on details of trees (Mystical Connections: Photographs of the Visible Landscape 2001 – 2004). 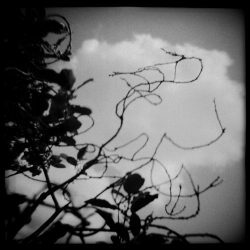 These images were captured with a plastic toy camera called a Diana camera loaded with medium format black and white film. The resulting gelatin silver prints are both archival in printing and presentation. Mr. Lizon is currently photographing his young daughter Emma using an iPhone. This project began on the day she was born and has been an ongoing daily “visual diary” of his relationship both as photographer and father to his daughter. This work seeks to explore such topics as childhood, family, female identity and social media. 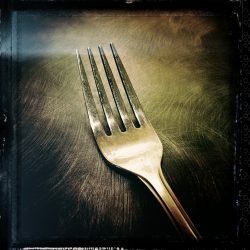 These images of Emma are not only captured and edited strictly on an iPhone but are also uploaded directly to his Instagram account of which he maintains daily. Visit our Featured page for more of Chisropher’s work. Christopher Lizon – Christopher Lizon – © photograph. Select image to view larger.